Marathon Sprint – We Got This! Today marks the three-month anniversary since Ryan stopped receiving baclofen from his surgically implanted abdominal pump. More precisely, it happen at 11:23 AM that day. After an aggressive and nerve-racking ten-month schedule to reduce his dosage it finally happened. In total, Ryan was on baclofen for two years and four months. If you remember, I set a window of three to six months after we stopped the baclofen to get the pump removed from his body. Well, I can see no reason not to do this as soon as possible. Ryan clearly doesn’t need it and getting another piece of hardware removed from him can only be positive. It will be wonderful to look at his stomach and not see a huge bulge, like he swallowed a comically-sized hockey puck and it’s pushing its way through the colon. So today (like every other day, I suppose), Sue and I will be on the phone talking to hospitals, doctors, and insurance. I’ll call the Neurological Surgeon from Morristown, NJ — who put it in — to see if she has a recommendation on who should take it out from our area. I’ll also ask IBRF for a referral. I even check with Kessler Institute; where Ryan spent five months in rehabilitation. I was just about to say that at least we wouldn’t be talking to an attorney today about the pending civil case, but I then remembered we must. What can I say? It’s a typical day of piles of paperwork, back-to-back phone calls, and monotonous red tape. Sue takes the brunt of this, spending every available weekday (and many weekend) minute dealing with one issue or another. Her morning and evening commutes are consumed with working through these nightmarish problems. Evening are spent on the computer and phone. She does all this and works hard at a career that provides for our family, never sacrificing either for the other. She does both superbly and I seldom hear her complain. That’s not to say it’s not noticeable and it’s not beating her down. She doesn’t so much drift off to sleep each night as collapse from exhaustion and frustration. Oh yes, I hold Ryan’s attackers accountable for this too. This is a terrible life that was aggressively forced on our family. It never lets up. It’s intense and there’s never a day off for either of us. Saying Sue takes a “vacation day” is a joke. Nothing short of mocking. Her days off are used for Ryan’s surgeries, appointments, legal battles, or being able to put together some uninterrupted time to plow through a particularly difficult problem. How does she do it? It’s an eternal marathon… run at a flat-out sprint speed. God, please let there be NO early release for Austin! There is no rest for the Diviney family. Ken, Reading all you and Sue have to do EVERY day is unthinkable, but we know unconditional love keeps moving you and will continue to ,till Ryan is better. Amazing it’s been 3 mos without Baclofen ,hope you have pump removed soon. Could it be a little uncomfortable for Ryan? Why there should be any “red tape” in cases like Ryan’s is beyond me.They NEED all medicines ,procedures, 24/7 care, equipment,etc. that is available, and to make things more difficult for you and Sue is cruel. Ken, I presume this surgery will take place after Ryan’s eyes heal. I can’t imagine the pain involved in suturing the eyelids! 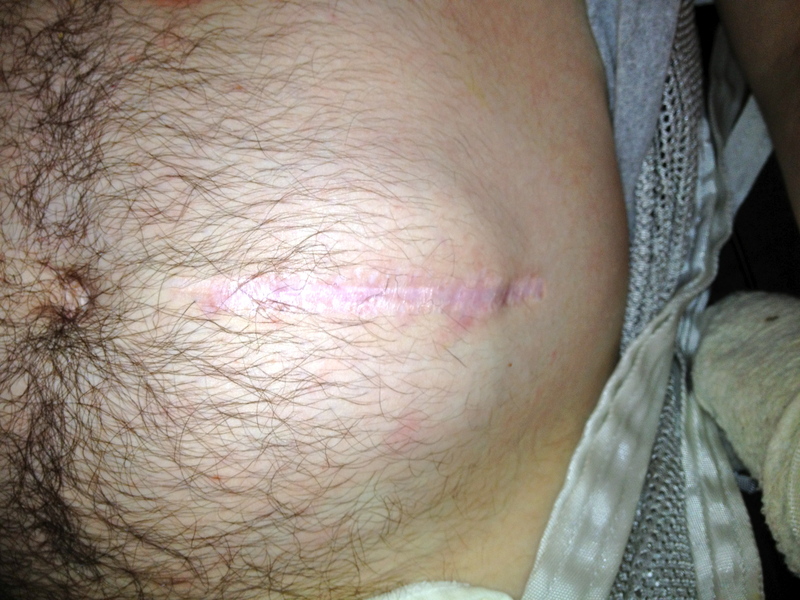 Those of us who have had abdominal surgery can relate to the pain from incisions of this area! Aarrgg! 🙁 Prayers and more prayers needed for Ryan, especially during the next several weeks. He is always on our mind. We also lay the blame on the perpetrators, of course! Poor Sue! I don’t know how she does it along with her job that involves a lot of travel. I wish she had a competent assistant, but know this would be expensive. I know her “Crew” helps as much as possible, thankfully. Thank you for this very important and informative update. And in the meantime Ryan’s attacker sits in prison getting three meals and a cot and a lot of time on his time. A lot of time to remember what he and his fellow idiots did to Ryan, his family and his internet family. My prayers continue for Ryan and his family. I know that our Lord is with all of you each moment of the day. He will never give more than you can’t handle. It’s just so unfair — what this “nice young man” Austin VanTrease did to Ryan, and to you and your family. In one moment of horrific rage, he stole so much — I can’t even do it justice with words. I suggest you make a packet for the judge, compiled of the blog posts that capture the loss, suffering and heartache. Be sure to include today’s post. Ryan will always be an inspiration to us, along with you, Sue and Kari. We’re just going to keep on standing by you the best way we can. And pray for healing and never give up. Thinking of you all and keeping you in my heart. Sue does an outstanding job and we pray for Ryan’s family each day for strength and support. God Bless you. You both are amazing! So happy Ryan hasn’t needed those meds for 3 months! Just plain awesome! Did the baclofen help alot with his tone…if he had any? Ben struggles alot with this. He had a trial when we were at shepherds but it made him soooo sleepy! Granted that was only 3 months after the accident! There’s no way to gauge how much it helped, but it did seem to. The best thing for Ryan (for tone), aside from exercise, is the HBOT. We started noticing him begin to loosen in about 4 – 6 months.